When the colourful racehorse trainer Ginger McCain wanted to mark his fourth Grand National victory, some 27 years after the last, there was only one place to do it. Following Amberleigh House's win in 2004, he quietly made his way to the Aintree grave of his beloved triple National winner Red Rum, buried alongside the winning post. He joked that the horse, who had died nine years earlier, spoke to him about his latest triumph. "[Red Rum] said 'let him win it twice more and he might be nearly as good as me'," said McCain. "It's just lovely to know he's buried where he is on the line and every time a horse goes across to win you can hear him saying 'well done, but you're not as good as me'. He was like that." McCain, who has died aged 80 after suffering from cancer, was a character who lit up Aintree with his unaffected love for the four-and-a-half mile race that captures the world's attention. As the years progressed, his face became as red as the horse's name with which he was so inextricably associated. He was politically incorrect, eccentric yet somehow endearing. Speaking to Ginger was like talking to a slightly barmy yet commanding uncle. He had an uncanny knack of putting a smile on your face. In 2005, McCain sparked a sexism row when he claimed a woman jockey could never win the Grand National, but he downplayed the controversy a year later. "People are very nice to an old dog like me, which is lovely," said McCain. "There was that episode last year - the silly, silly stuff with Carrie Ford, and I said if she won the Grand National, I would bare my bottom. "When we went in, the gateman shouted: 'Hey, Ginger, if that woman wins the National, they'll be queuing up all the way to Anfield to kick your backside.' That's typical of what I get, and it makes for a very, very good day." McCain was saved a kicking as Ford finished fifth on Forest Gunner. And despite his public pronouncements, he was on pretty good terms with leading women in the sport, such as National-winning trainer Jenny Pitman and BBC presenter Clare Balding. 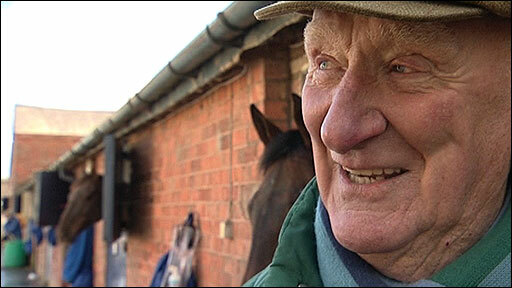 McCain met Red Rum's owner, the wonderfully-named Noel Le Mare, when he drove a taxi. "I'd pick him up right on the dot of 12 o'clock, and drive him home, and he'd invite me in for a drink," he recalled. "Well, I was brought up in a family in which you didn't drink whisky, or even sherry, unless someone had died or got married and I'd have three enormous scotches and talk horses. It went on from there. "The guv'nor had three ambitions in life: to marry a beautiful woman, make a million and, at 86, he fulfilled his final ambition to win the Grand National, and he did it three times with 'Red', and was second twice, which was magic." He persuaded the owner to part with £6,000 for the horse, who was discovered to be lame as a novice chaser so McCain sent him to the seaside at Southport. "He came back with us sound as a bell," said McCain. "Being at Southport, with the beach and the sea, was very important to him, and I don't think we quite appreciated it at the time. "We had one of the best all-weather gallops in the country, and the best swimming pool, and the water was great for his legs. " 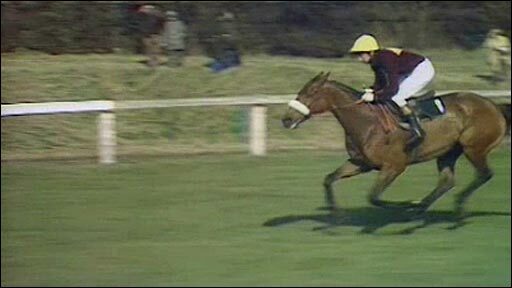 Red Rum became a hero to racegoers and once-a-year punters, but he began his National career as villain when he overhauled the gallant, exhausted top-weight Crisp in the final strides of the 1973 race. "It was very much like the tortoise and the hare. The old horse stuck his head down and ran to the line. The tortoise won," said McCain. A year later, Rummy emerged from his stables behind a second-hand car showroom to win again. He was runner-up twice before a historic third victory in 1977. 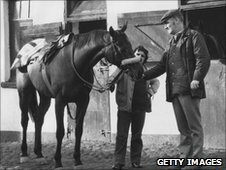 "Red Rum is given a famous reception. You've never heard the like of it at Liverpool," boomed BBC commentator Peter O'Sullevan, who like the horse was born in Ireland. The horse, like his trainer, thrived on the heady atmosphere of Grand National day. "He loved Aintree, and revelled in the challenge, and was a complete professional, a great character, and, it may seem silly to say it, but he was a horse with a great charisma, like I have never seen in any other horse," said McCain. Red Rum may not have been the classiest racehorse. He never won Cheltenham Gold Cups, for example, like Best Mate and Kauto Star, and was third behind Arkle and Desert Orchid in a 2004 Racing Post poll to find their readers' all-time favourite racehorse. But he made the world's most famous race, a marathon over 30 fences including daunting obstacles such as Becher's Brook and The Chair, his own. "You know, one of your daft reporter fellows said it must have been like losing the wife when he died," said McCain. "Losing the wife? There are 25 million women in this country - what a daft thing to say - but there was, and always will be, only one Red Rum. " They will never make another Red Rum, and they will never make another Ginger McCain. Two racing greats who were made for each other. Ginger, like his son whom he handed the training reins to in 2006, was also christened Donald but widely known by his nickname. Born in Southport, Lancashire, he started out as a used car salesman but became synonymous with the horse nicknamed 'Rummy'. "I'm no legend, I was associated with a horse who was a legend," he would say. 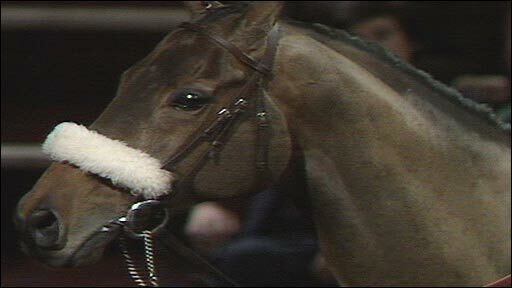 In 1977, Red Rum was brought into the TV studio where the BBC Sports Review of the Year show was staged. "He was listening to the applause in the back and thought it was for him all the time," said McCain. 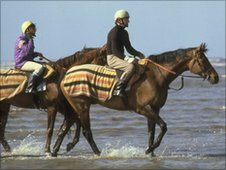 After his retirement the following year, the bay gelding who was placed in 52 of his 100 races embarked on a second career as a travelling celebrity. "He switched on Blackpool Lights, he opened hypermarkets, pubs, and cricket clubs," his trainer said at the time. "He really enjoys it. He likes seeing people and doing these unusual things." When Aintree staged a special Red Rum meeting to mark his 30th birthday in 1995, the course attracted 10 times the usual crowd. It was a fitting tribute as his successes in the 1970s came at a time when the race was struggling for sponsorship. "People say he saved the Grand National and when I think about it and analyse it, I think they are right," said McCain. Any trainer's relationship with a horse they see and care for every day can be an emotional bond. As McCain watched Red Rum die, he had tears in his eyes. "He was a very, very big part of our lives for 23 years," he recalled. "He had a charisma all of his own. He loved people and people loved him. The old lad was magic," said McCain. An epitaph fit for Ginger.